Victoria Falls is a dream wedding destination. Every detail of your ceremony and reception is tailor- made by our team of professionals to suit your needs – be it beside the Victoria Falls, on the banks of the Zambezi River or at sunset overlooking a wildlife-rich waterhole at our Victoria Falls hotel. 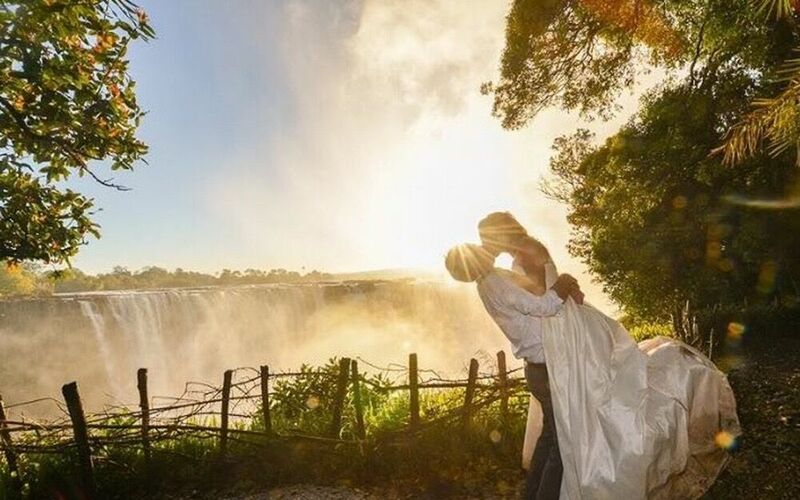 The sunset- facing Victoria Falls Safari Lodge estate has several great venues for both wedding ceremonies and receptions, but your nuptials may also take place at a range of locations off the property. Victoria Falls Safari Lodge’s library – situated at the highest viewing point of the lodge and overlooking the waterhole. At sunset, this private venue offers a beautiful setting for a memorable and intimate ceremony for up to 15 people. Victoria Falls Safari Lodge amphitheatre – this open-air venue with a leveled stage and surrounded by terraced grassed banks is the largest venue on the resort, comfortably accommodating 200 people. The Indaba Conference Room – this thatched A-frame building opens onto a small balcony overlooking the African bushveld with a view of the spray of the Victoria Falls. It seats 70 guests for dinner or 40 guests with a dance floor. The Boardroom – with a view over Zambezi National Park including the estate’s wildlife-rich waterhole, it can accommodate 20 guests for a gala dinner. MaKuwa-Kuwa Restaurant – partially open-air and with excellent views over the estate’s wildlife-rich waterhole, may be booked exclusively if 60 to 80 per cent of the wedding guests are staying at Victoria Falls Safari Lodge.